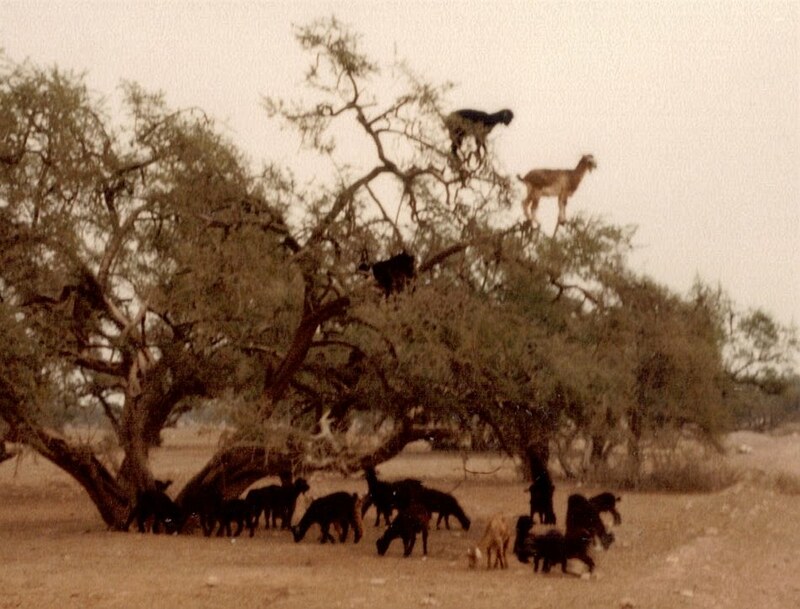 I had a dream about goats in trees. I thought nothing more about this until my wife was looking through one of our photograph albums - and there they were again, goats in trees. The photos (as shown on this post) were from when we visited Morocco, a few years back. 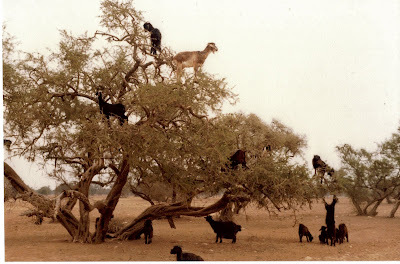 We were on our way to Marrakesh and there at the side of the road were all of these goats climbing into trees. The area before the Atlas mountains is very dry and dusty and, as there is little for the goats to eat on the ground, they climb into the trees to munch on the leaves. At the time we were quite amazed by this but, as happens in Morocco, after a few minutes a man arrived out of nowhere demanding money for taking pictures of his goats. I gave him something but he obviously didn't think it enough so we continued with our journey instead of arguing with him. 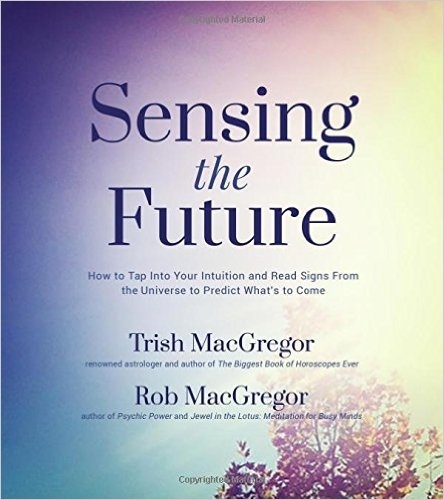 The following day after my dream I was at the dentist for a routine check up (nothing needed doing - what a relief!) and was flicking through some ancient magazines, that waiting rooms always seem to have, and came across an article about the very Moroccan goats I had been thinking about recently. Following this goats seemed to be everywhere! In conversations, pictures and so on. I've been pondering as to the significance of these goats, if indeed there is any. I googled 'goat symbols'. According to Catholic Symbols, "The Goat Christian Symbol represents oppressors, wicked men and demonic forces. The goat also symbolises unrepentant sinners who will be separated from God on judgment day which is associated with the following Bible verse: Matt 25:33 He will put the sheep on his right and the goats on his left." Not really happy with this I also discovered that in dreams goats indicate: 'Vitality, fertility, creativity, virility, abundance and lust'. That sounded a bit better! But somehow still didn't feel right as an explanation for goats and goats in trees relative to my life. I still haven't reached any conclusion. Perhaps it's just to tell me to get travelling and discover some more interesting and unusual things. What an interesting sequence of events. Some years ago, I co-authored a book on animal totems. Our entry for goats reads: You set goals and push against any obstacle to attain them. Be diligent and tenacious and you'll succeed. Don't become discouraged; you'll get to where you want to go." Thanks - that's interesting, could be! 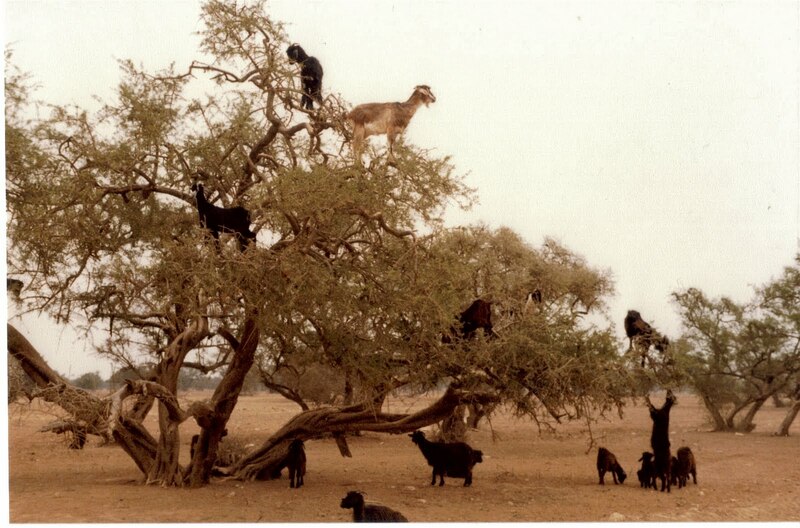 never heard of goats which climb trees before. youve been to some nice places. Hey, I've seen these goats in Morocco as well, that's a coincidence! Thanks for link - it all happens at Byron Bay! Hi Mike, I'm just now in Morocco and tomorrow we have a plan to try find those goats. We are now in Marracesh. You said you saw goats on your way to Marrakesh but from where you were coming? From Essaouira? I can't remember exactly where we saw the goats. We were travelling from Agadir on the coast to Marrakech via Atlas mountains and they were seen from the road. We stopped, took photos and then someone appeared from nowhere demanding money!